The last time I needed to renew our passports I spent hours clicking through pages on government websites in search of answers to some pretty basic questions: What forms do I need? Where do I send them? Where can I get help. The next time I need passport help, I plan to use an iPhone app called My Passport & Visa App. 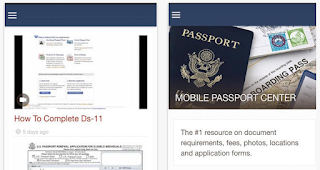 The publishers of this app have collected and organized all of the information a US citizen would need to know about applying our renewing a passport or visa. The app includes information about application forms and a set of video tutorials showing how fill them out. Users can also find locations where they can apply in person, options for getting a passport photo, a list of services such as Rush Passport Center that will expedite the passport process for a fee and a link to track your package when you send documents. The app is a free downloading the iTunes App Store. I works on iPhones, iPads and the iPod Touch.